ESCONDIDO, CA (Oct. 9, 2014) – Today, San Diego-based Stone Brewing Co. announced it has signed a formal letter of intent with the City of Richmond, Virginia, signifying the company’s interest in building its East Coast facility in the city’s Greater Fulton Community. Subject to local approvals, Stone plans to invest $74 million to construct a production brewery, packaging hall, destination restaurant, retail store and its administrative offices. Construction of the facilities will occur in phases. The brewery is anticipated to be operational in late 2015 or early 2016, with Stone Brewing World Bistro & Gardens opening a year or two after that. Ultimately, the company will employ more than 288 people. This is the second expansion announcement Stone has made this year. In July, the company unveiled it will become the first American craft brewer to independently own and operate a brewery in Europe with the opening of Stone Brewing Co. – Berlin. 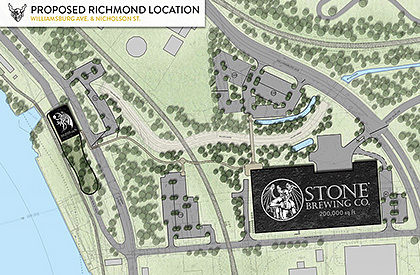 Share "Stone Brewing Co. Names Richmond, Virginia, as Future Home for New Brewery and Destination Restaurant"